Oral Health Care has long been perceived as separate from physical health and not a part of overall well-being by the general public. As a result, studies show that the lack of good dental health has strong financial, emotional, and physical implications. Children are likely to have self-esteem issues, poor nutrition, school absences, difficulty learning, and other physical complications due to untreated tooth decay. Among children, those who are lower income, uninsured, and minority populations suffer at higher rates of tooth decay and are more likely to go without treatment than others. Miles of Smiles exists to serve Riverside elementary schools with education in oral hygiene and nutrition and with subsequent dental screenings and the placement of sealants. The Miles of Smiles Head Start/Preschool program was developed with the goal of helping young children have a positive experience on their first dental visit. 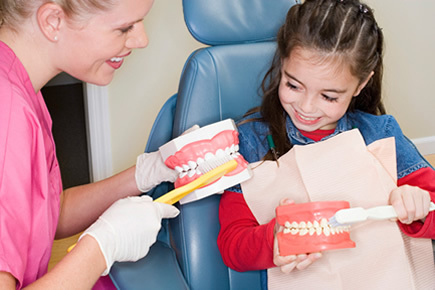 A dental screening and placement of fluoride varnish are provided during this visit. Miles of Smiles currently serves, Alvord Unified School Districts, Jurupa Unified School Districts and Riverside Unified School Districts. For more information on how to bring M.O.S. to your school please contact Veronica Montes, Dental Health Program Assistant at (951) 788-3471 or Veronica@rchf.org.